Jonathan Lang, who owns Lang Farm in Essex Junction, said his business hosts about 30 weddings a year, many of them for out-of-staters. If marijuana was legal, Vermont would draw even more visitors, he said. 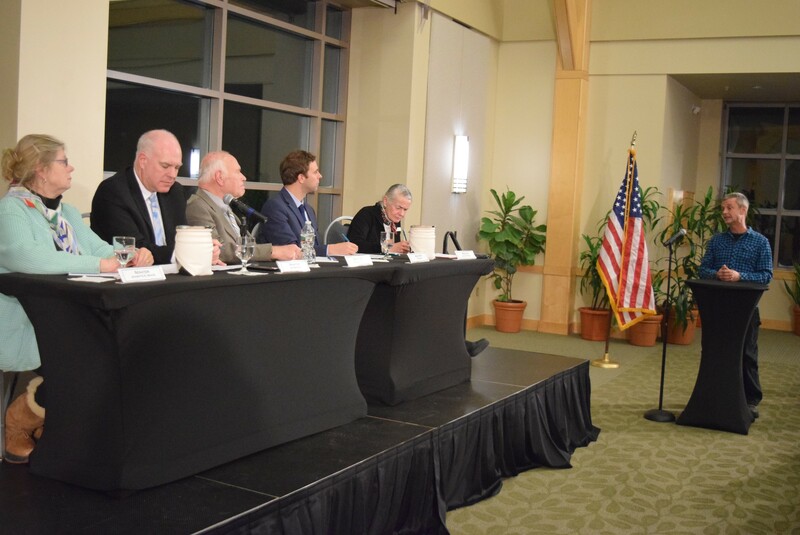 "I think we're missing a big opportunity," Lang told the Senate Judiciary Committee during a public hearing Tuesday night at the University of Vermont's Davis Center. Citing the attraction of Vermont's cheese, maple syrup and beer, he said, "It could be this, too." When the Senate committee, which is considering legislation that would legalize recreational sale and use of marijuana, went to the state's largest city and held a hearing at the state's largest college on whether to legalize marijuana, most in the audience — not surprisingly — were for it. Speakers stacked up 21-7 in favor of legalization, according to Sen. Joe Benning's count. The Republican from Caledonia County, who supports legalization, said speakers at three earlier hearings this week, in Bennington, Brattleboro and Springfield, also leaned in favor, but by smaller margins. He said he expects a hearing Wednesday night in St. Johnsbury to draw more nay-sayers. Following the five public hearings, the committee members expect to work out details in the coming week and vote out a legalization bill by January 29. If it passes this year, Vermont could become the first state to legalize marijuana by a legislative vote, rather than a public vote. What might have been most surprising about Tuesday's hearing was that the spacious Maple Ballroom wasn't more full. About 150 people — including legislators, lobbyists and the head of the local medical marijuana dispensary — turned out for the hearing. Most of UVM's 10,000 undergraduate students, who just returned Tuesday for the winter semester, passed on an opportunity to debate what could bring the biggest cultural change to campus since the drinking age rose to 21 in the 1980s. Those who did speak offered a range of opinions. "Let's consider a way that keeps Vermont different," said Alan Turnbull of Burlington. "How about we just consider legalizing marijuana without making it for sale legally?" Kim Maloney of Westford kept his pitch simple. "I've been smoking pot 40 years. I have to go somewhere to buy it illegally. I don't want to do that anymore," he said. Gloria Varagallo of Jericho was among the minority speaking against legalization. She said she knows too many people who have used marijuana and other drugs and became more depressed, anxious and unhealthy. "I miss who those people have been before they started using," she said.